I am so incredibly brave from behind a computer screen. Long, treacherous hikes are entirely doable, even running off of a mountain didn’t seem too bad at the time. 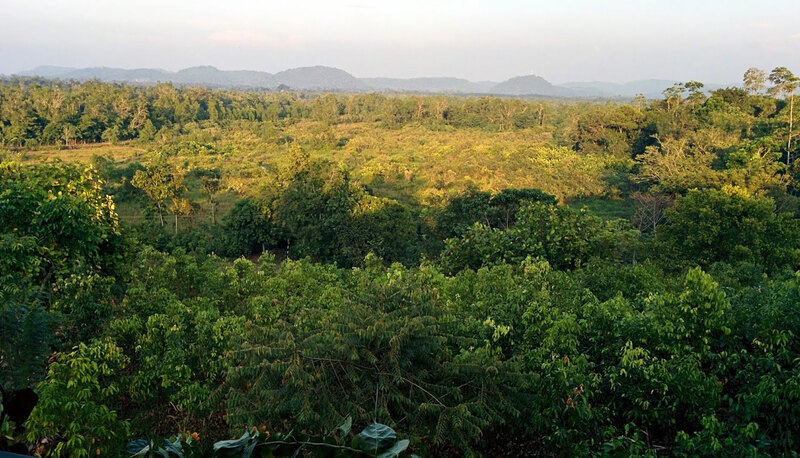 You can entice me to do just about anything with a juicy photo of scenery that will accompany the task. I convince myself that I am a brave and adventurous soul, and that there is nothing I can’t do. Then, come ‘game day’, I whine. I freeze a little, I curse a lot, and when it’s over, I always vow that I’ve reached my adventurous limit, and I’ll never do anything like that again. But time is a gentle yet treacherous beast. Enough days pass to make me forget about the fear and I feel invincible again. And when I stand poised to start the next foolish adventure I talk myself into, it all comes rushing back. Who am I kidding, really? I am a total wimp. Yet I keep putting myself in these terrifying situations. Slovenia is an adventurer’s haven. 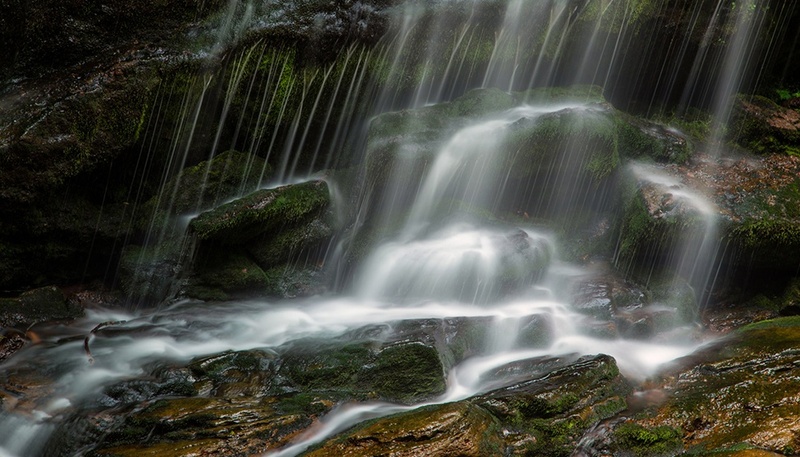 The Triglav National Park in its northwest corner offers world-class white-water rafting, kayaking, canyoning, and more. 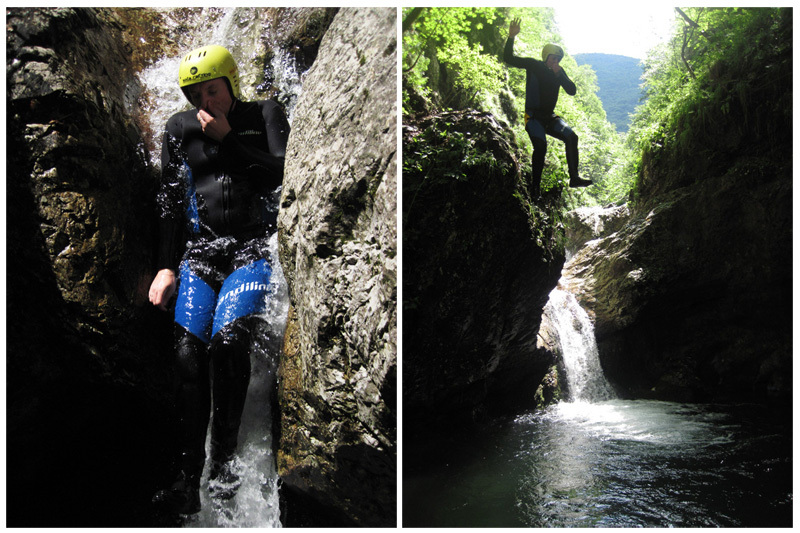 We left it up to our Facebook fans to decide what we would do – white-water rafting or canyoning. 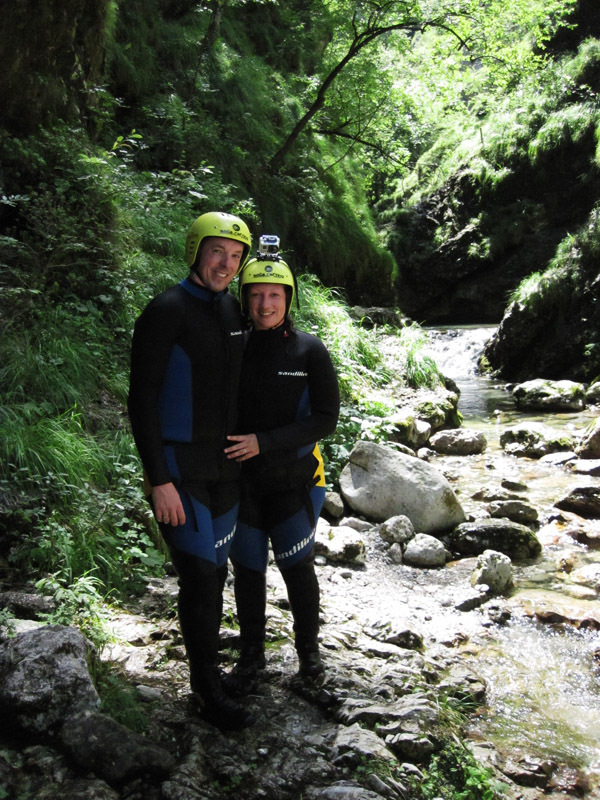 They chose canyoning, which was my preference anyway, seeing as we had never done it before. Say, what now? Why had that not occurred to me? Once again, I had been seduced by the pretty pictures. Enter frayed nerves. I was practically mute for the rest of our trek to the top of the canyon. And the only way out was to endure sliding down natural waterfalls and jump several metres into small pools in the Šusec Canyon. We strapped our GoPro video camera to my helmet and I filmed almost our entire journey. However, I got the angles wrong a lot. For most of Pete’s jumps and slides, I only showed water splashing and nothing else, so he is barely featured in the video. Me = bad wife/videographer. You might guess from the title of this post that I used a bit of profanity in the face of danger. You would guess right. I honestly can’t believe I am showing this in public. Do I really sound like that? To my Mother, who has a strong fear of water, you might want to pour yourself a glass of wine before watching this. I look really happy! This might have been a “before” picture. Pete would do it again tomorrow, for sure. Yep, that’s me, mouth wide open and screaming as I was going down backwards. My favorite slides were the ones we went down head first, like Pete is doing on the right. Our sincere thanks to Soča Rafting for this heart-racing excursion. We were so happy to have done this adventure with the longest-running company in the area – with their expertise, pleasant staff, and strong attention to safety. Our guide Zan was also incredibly patient with me. If I were him, I probably would have pushed me in a few times. I’m glad he didn’t. 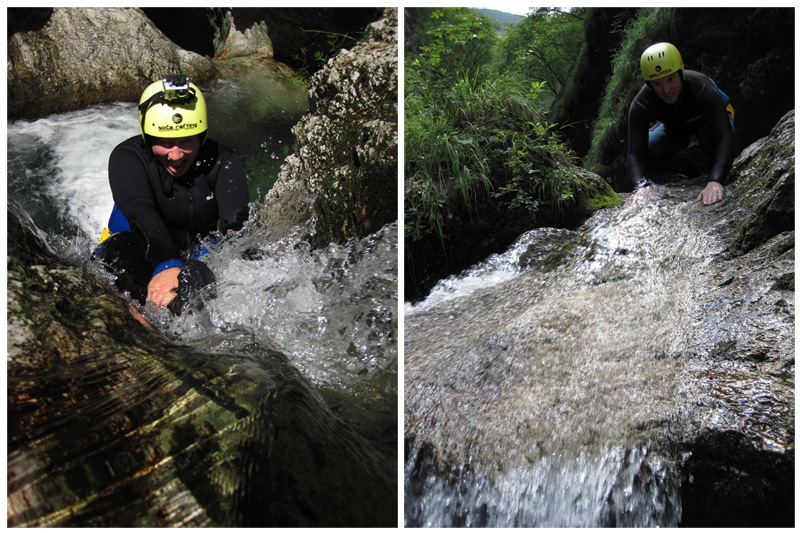 And while our canyoning adventure was complimentary, all opinions and girlish screams, as always, are our own. Amazing video, this looks like such great fun. I’m looking to go to Slovenia next year, will have to look this up. You know.. I went through this whole video wondering if Pete was actually real. And then he finally appeared. Also.. potty mouth young lady! Canyoning looks entirely like my kind of thing though! “3…2…1…GO!” “…that doesn’t work.” BAAHAHA! This looks AMAZING! Send me to Slovenia! I’m also terrified of heights. Not water, just heights. We had so many laughs going through all the videos and the sound clips. This looks like SO much fun! And what a great way to record it! 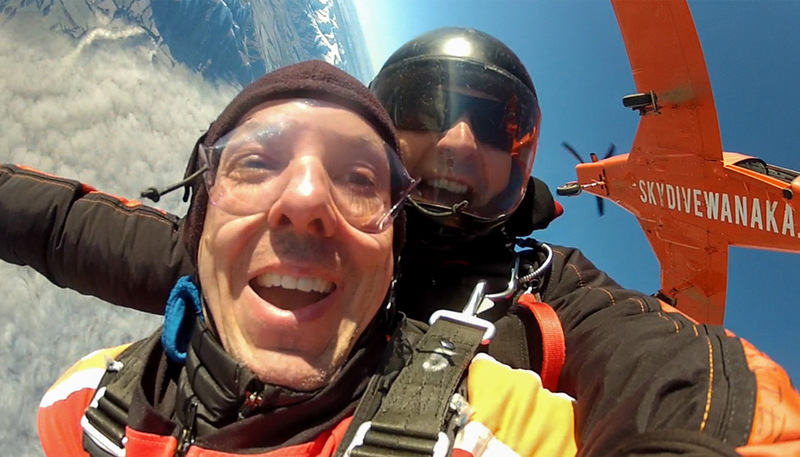 Photos don’t do the heights justice – but photos make sure faces more entertaining!! “…look into the camera, and bye-bye!” haha!!! I would’ve been saying the same things, IF they even convinced me to slide down a rocky chute – backwards!! (the jumping I think would not be as bad… ??) Looks like lots of fun! That was the craziest decent for sure. Dalene’s motto is don’t think, just do. If she thinks about, she’ll most likely bail.. All in all lots of fun and I think we would both do it again…. I’ve wanted to try this but I’ve never been good with the jumping from heights thing. The wetsuit and helmet must help though, no? Good for you Dalene!! The wetsuit helps huge for the cold water and sliding down the rocks. And the helmets did save us a few times from some bruises. The jumping was probably the most intimidating thing, but Dalene was a rockstar (even if she didn’t do them all). I’ve always wanted to do this! I bruise so easily though, I’d need a couple of layers of wetsuit to pad me from banging into stuff. That’s awesome! Blake says “she’s a bit of a chicken on that one, isn’t she?” haha! He also says he wants to go there next year for his 8th birthday! Oh my god. First off, I had no idea something like this even existed. Second off, you go girl!!! I love the “I almost did it.” Very proud of you! Wow. They do this up in the Swiss Alps too. It always sounds unpleasant. I definitely avoid things that are described as adrenaline rushes. In fact I structure a lot of my life to explicitly avoid such things. Dalene tends to look back on these ventures and wonder what the hell was I thinking. Are we all not like that? Courageous behind the computer!!! Its pretty scary to look at you doing all those stunts! Wonderful captures and What a fab video!! I’ve done this before and while I was a bit scared at the beginning (not a big fan of heights) I did enjoy right after slide number 2. Good fun! It was a lot of fun for sure. You’re right that the scary factor wears off pretty quick. What an adventure!! I didn’t know the term “canyoning” existed, but it looks fantastic! You’re very brave…not sure I could do it myself! We first came across the term “canyoning” when in Ecuador and I was always intrigued. I would totally do it again! Dalene, you ARE a great videographer, if only because you have more guts than I do! This looks like so much fun! I love rafting, but this looks terrifying! You guys are brave in real life too, not just from behind the computer. aw thanks Emily 🙂 We LOVE rafting too. Either option would have been lots of fun with the company we dealt with. So very professional. Amazing and totally crazy! Wow! Looks like lots of fun (says me in front of the computer screen lol). I thought your language was pretty tame, all things considered. You go! Yeah, there’s no way I’d do this. Very impressed you went for it. I’m happy to sit on the sidelines of things like this and just take pictures. I feel so much better now that I know I’m not the only one that gets scared at things like this! I think I’m adventurous too and would probably do this but am sure everyone watching would be able to hear my heart pounding as I gussied up the guts to go! Fun and beautiful! Debbie Beardsley @ European Travelista recently posted..Germany, Bavaria, Munich – Need I Say More? Thanks Debbie! I’m glad I’m not the only one. Although if you and I did it together we’d probably just scare each other and STILL be up there trying to do it – haha! You didn’t get to hear all the edited portions. 🙂 Trying to keep the site family friendly! You seem to have the same mentality as I do when it comes to things like this. Did your helmet come with the Go Pro attachment or did you guys bring your own? I love the video! I would totally be doing the exact same thing. Good for you to keep conquering your fears! Thanks Franca, it was certainly a lot of fun and I would for sure do it again. I think Dalene will need some convincing.